Sisters Salute support our troops. We owe our armed forces so much for all they do to protect our freedom. Show your support for our troops. Strassburger Meats support the men and women in our Armed Forces. Since 1919 continues to fulfill its Mission, as the only Organization in the New York area To provide accommodations at subsidized rates and club-type facilities for members of the Armed Forces, Veterans and their families and those of our Allies, visiting or passing through New York City. A Navy man, and a dedicated supporter of the club and our brave military. He was recently profiled in the Wall Street Journal. The Soldiers', Sailors', Marines', Coast Guard & Airmen's Club (SSMAC) Is not affiliated with the U.S. Federal Government, the State of New York, or the City. Established in 1919 by patriotic citizens, Mrs. Cornelia Barnes Rogers, Mrs. Theodore Roosevelt and General John J. Pershing, to house and support the thousands of returning servicemen and women from WWI. SSMAC credo was "Serving Those Who Have Served Their Country". SSMAC is a 501 (c) 3 Not-For-Profit Corporation registered under the State of New York. In providing its constituents very inexpensive accommodations in Manhattan. 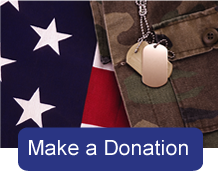 The club is dependent on your tax deductible donations as we continue to serve members of our Armed Forces, Veterans, their families and those of our Allies. We are grateful for all tax-deductable donations. All donations will be acknowledged with a letter to your return address.